The island called Great Britain is fairly compact when compared with larger countries, but it manages to pack in several variations in climate and vegetation. This is especially apparent when comparing magnolia progress. 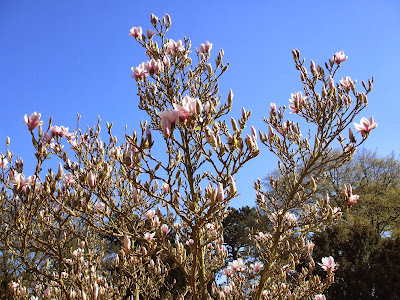 London may be less than 60 miles from Oxford, but even in the suburbs it is undoubtedly warmer, and on a visit to Roehampton last week I noticed magnolia trees in full bloom. 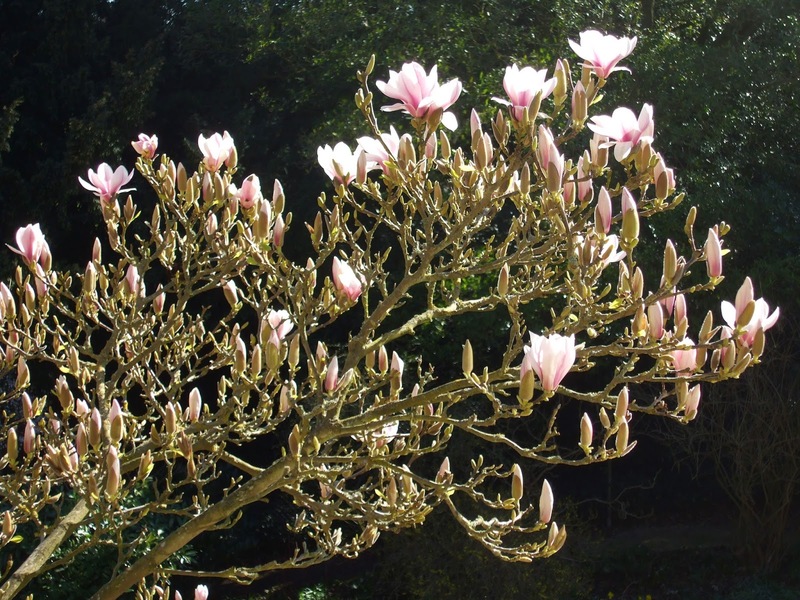 Then this weekend a visiting RSCJ from Llannerchwen, on a chilly hill above Brecon, just over 100 miles away, commented on how their magnolia was still a mass of tiny, tightly-furled buds, several weeks behind its city cousins. Our own magnolia is somewhere in between. Until about a week ago its buds were still closed; full of a promise and furled beauty they were not yet ready to reveal. But a day or so after last weekend's sunshine and warm temperatures I began to notice a few rosy-white petals emerging from their husks. These brave pioneers were soon followed by a few more, then more, and by Friday it was clear - even with fog and cold mornings, most of the magnolia buds were out! 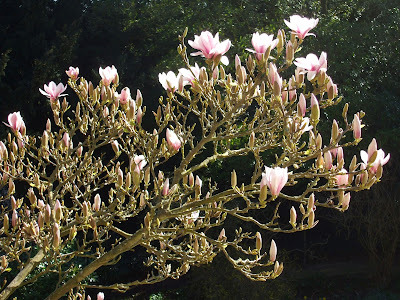 My friend Cloister, whom I have not seen in AGES, promised a while back to visit me before the magnolia was fully out. On Friday I therefore made sure she knew about the buds, and we started planning. Since then two wonderfully warm and sunny days have passed, and those first buds are starting to open. So Cloister, when you read this and see these photos taken today, you know you need to hurry up! Meanwhile, I continue to enjoy tracking the magnolia's progress, drawing lessons from its resilience and emergence into wide-open beauty, wholly focused on and reaching up to the sun which is its life.